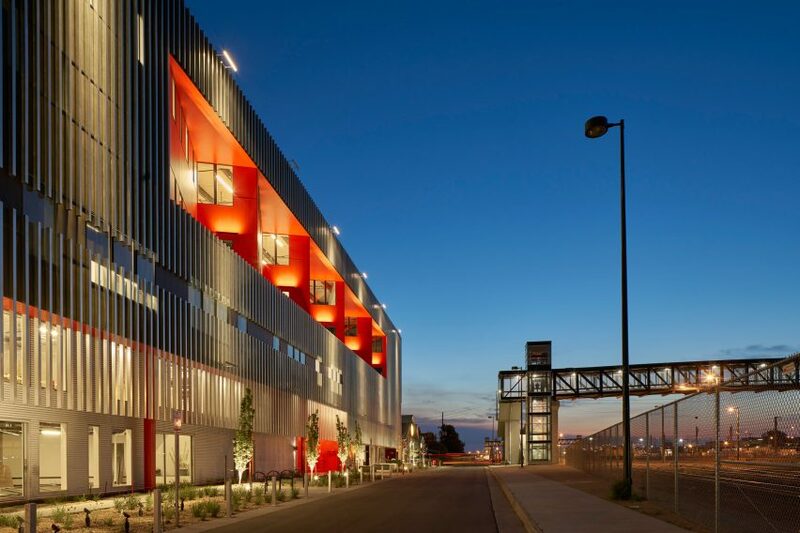 American studio Dynia Architects has completed a mixed-use building in Colorado’s capital city featuring a bright red wall to catch the eye of passing train travellers. 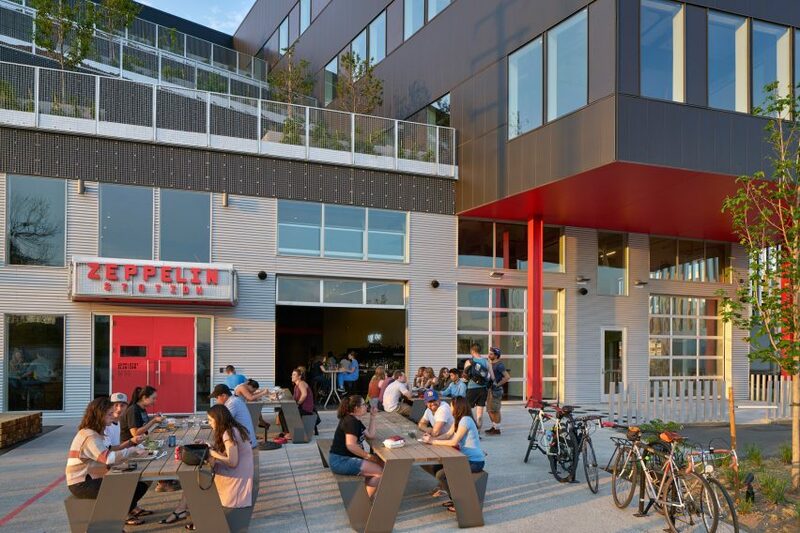 Encompassing 100,000 square feet (9,290 square metres), Zeppelin Station sits within Denver’s urban core, in an industrial zone that is quickly being transformed into a live-work-play district. Oriented to provide optimal city views, the four-storey building contains an international market hall on the ground level and offices above. Roughly rectangular in plan, the building’s design was informed by the site conditions. Adjacent to the building is a low-slung warehouse on one side, and a swath of railroad tracks on the other. A bridge traversing the tracks leads to the city’s River North (RiNo) district, known for its hip eateries and creative workspaces. A light rail stop is a short walk away. Evoking the area’s industrial heritage, the building is wrapped in fibre cement panels and corrugated metal. 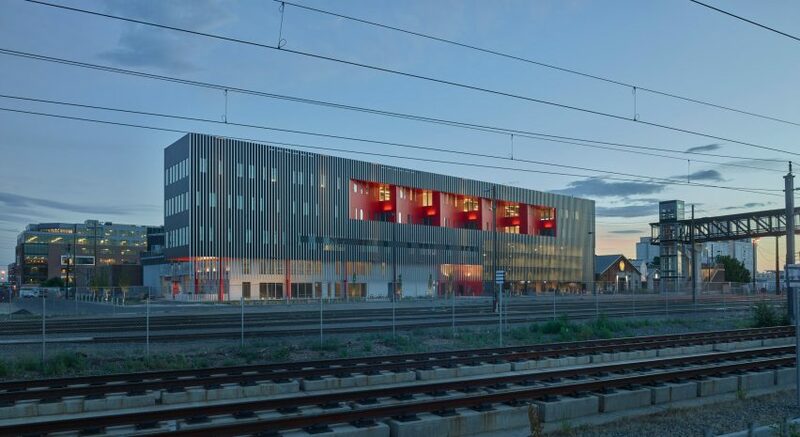 Along the east elevation, which overlooks the rail tracks, the team covered the facade in a brise-soleil made of standard, light-gauge framing members. The screen is meant to present “a singular identity across the expanse of the rail lines”. 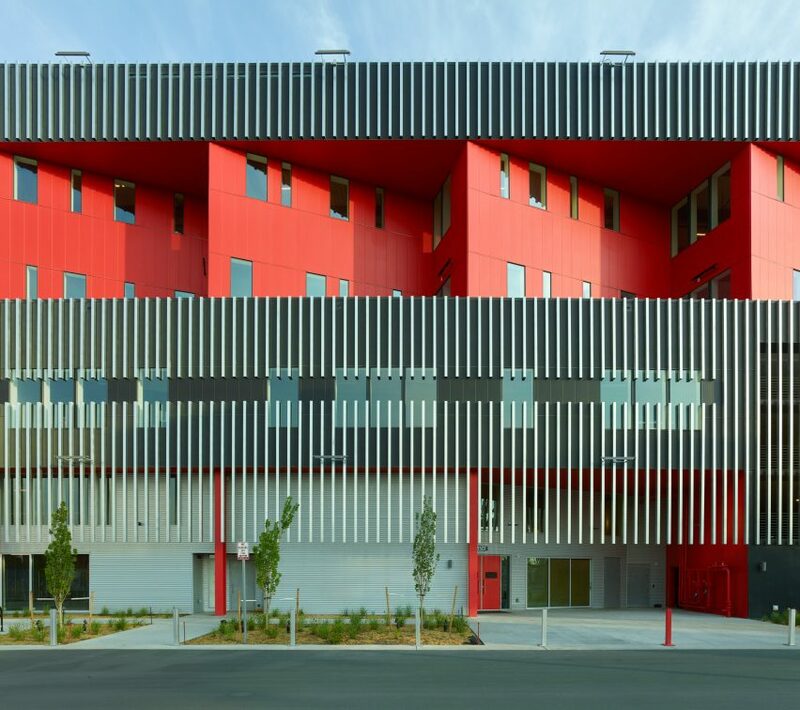 Appearing like a billboard, a large cut in the facade reveals red-hued, sawtooth folds that are positioned in a way that permits views of downtown Denver to the south. The configuration also helps block noise from trains as they rumble by. “Acoustical considerations due to the roar and clang of idling locomotives and coupling cars required judicious window placement and enhanced wall construction along this east elevation,” the team said. The south elevation also responds to functional concerns. On the ground level, glazed garage doors allow the market hall activity to spill outdoors. Above, a series of stepped terraces are placed at an angle in order to capture views of the city and the mountains in the distance. The terraces are adorned with bushes and trees that will mature over time, providing shade from the intense sun and serving as places of refuge for office workers. “These terraces create a lush foreground between large office suites and the skyline,” the team said. 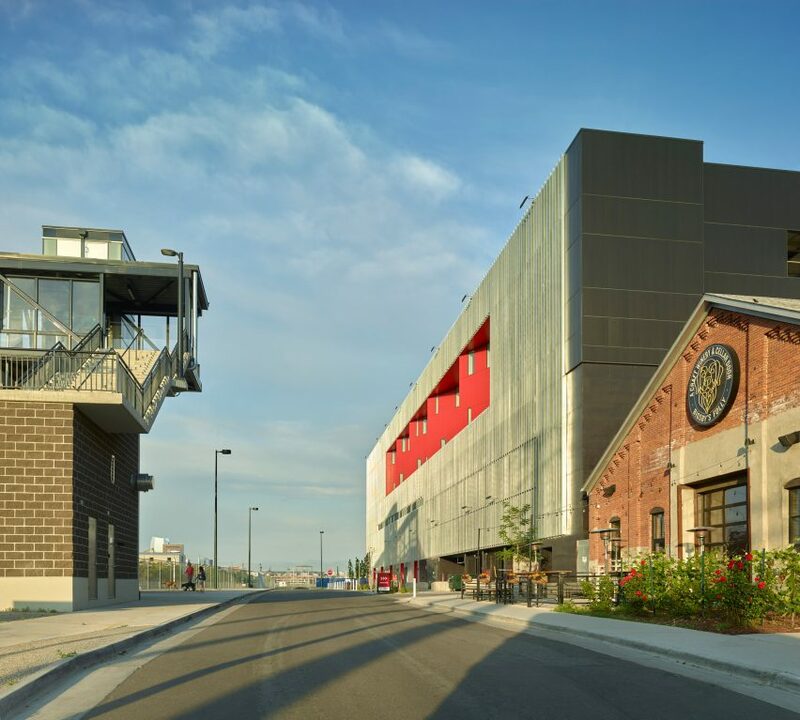 Inside, the building has a pared-down aesthetic that, like the exterior, seems to take cues from the area’s industrial past. 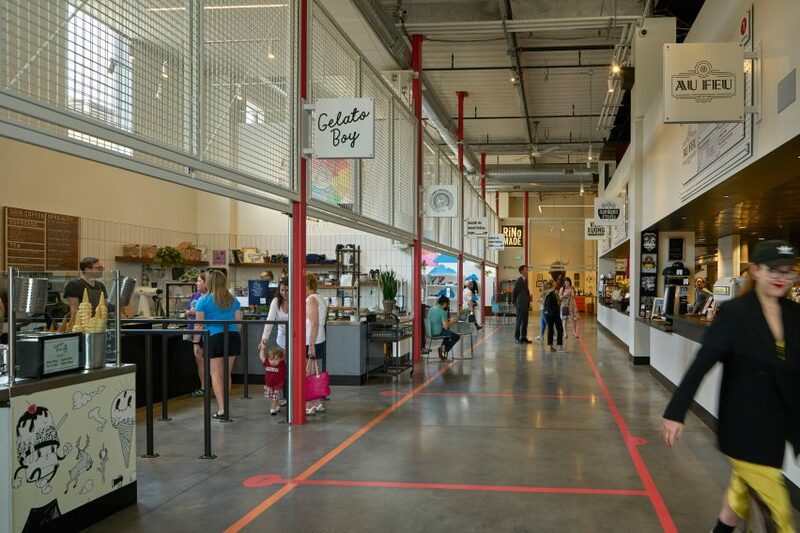 The market hall features high ceilings, exposed ductwork and concrete flooring. 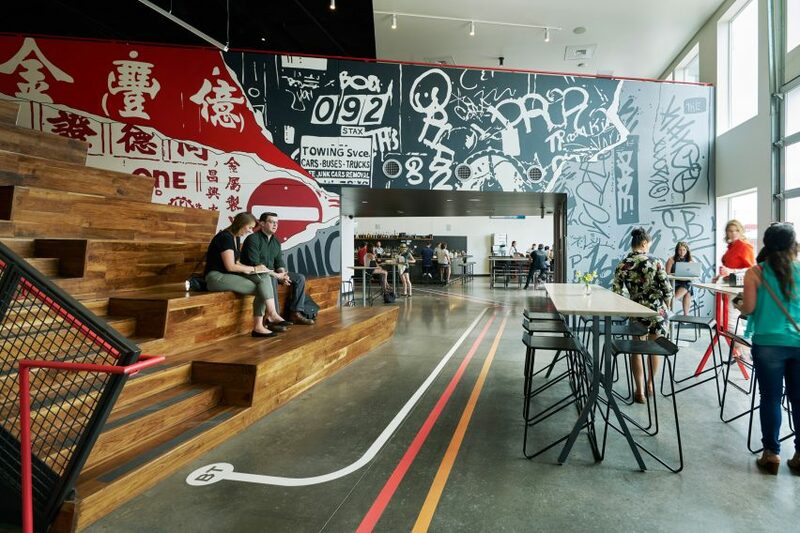 Wayfinding graphics that resemble a subway map were painted onto the floor, helping customers navigate the eclectic market, which offers casual cuisine from around the globe. In addition to its food and retail stalls, the market also has two bars: one on ground floor, and one tucked into a mezzanine level, which is accessed via a wooden staircase that adjoins stadium-style seating. In contrast to the bright and open market, the upper-storey bar feels somewhat dark and hidden. “The double-height first floor was designed to be light and airy – primarily white with vertically operable mesh retail doors and graphic wayfinding – whereas the mezzanine introduces an entirely different feel,” the architects said. Founded by Stephen Dynia and based in Jackson, Wyoming, Dynia Architects has an extensive portfolio of modern buildings in the American West. Others include the John Dodge residence at the foot of the Teton Mountains, and the Boulder Cabin in Colorado, which contains living spaces separated by thick partitions of Corten steel. 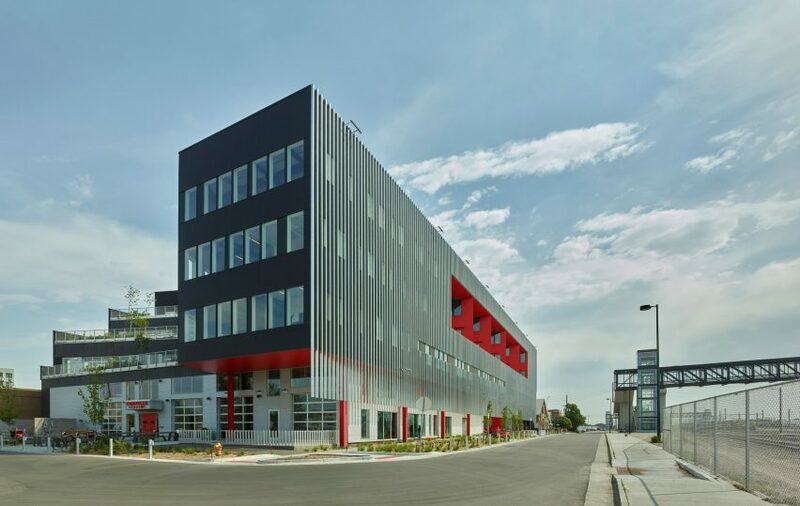 Be the first to comment on "Zeppelin Station market and offices by Dynia Architects overlooks rail tracks in Denver"